Ideal fastener element to fix sheets and profiles to walls, roofs, building materials and soft materials. Bralo Drive Rivet is synonymous with speed and confidence. Bralo Drive Rivet is an extremely effective method of joining sheets and profiles to soft and fibrous surfaces like walls or roofs. 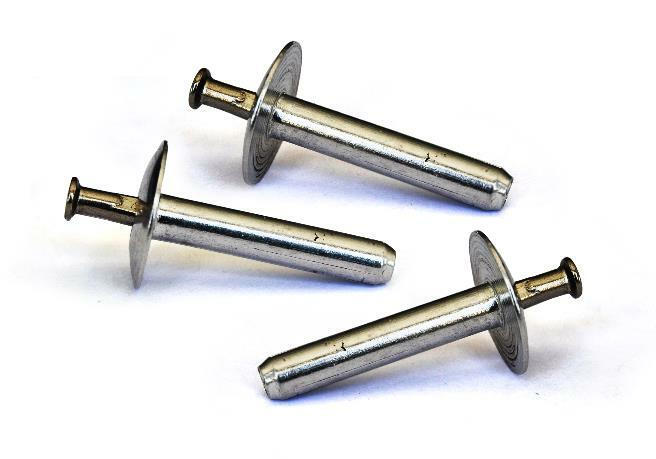 This type of blind rivet is widely used in the construction sector to fix sheets, mouldings, angles, coatings or insulation. This fixing element does not need through drills. The rivet mandrel (stainless steel) is forcefully introduced with a punch into the rivet body (aluminium), using for instance a hammer, opening the rivet body in 3 different blades fixing it inside the walls of the material to be fixed. This Drive Rivet does not require the use of a riveting tool and provides a great resistant fastening in applications where only one side is accessible. Not only materials with through drills but also with blind drills can be riveted with this item. It does not deform surfaces after the riveting process is finished – for painted, glazed surfaces-. Its large head creates a wide bearing area that makes it suitable for soft materials. It does not require any specialised tool. A simple hammer is enough to obtain a fast and secure fixing. Metal to soft materials and in general those with a low resistance. Construction work: sheet fixing, moldings, angles, insulation, coatings, etc. It is quite often that specific needs require specific solutions. If your application requires drive rivets with a special finish, our technical department will provide full support to your needs and will work with you to your satisfaction. Should you need special information about finishes, do not hesitate to contact us or check our Superficial Finish and Coatings section in the Technical Information Department. DRIVE RIVET Aluminium Stainless st.